Snowy courses and woolly socks! In recent years ‘barefoot running’ has become something of a trend, but this isn’t so practical in winter with snow all around. So what’s the solution for the minimalist runner? “I’ve got several pairs of ordinary woollen socks which I wear in turn. When I run I wear three pairs of socks: two pairs of woollen socks and a pair of ordinary sports socks underneath them. Some runners wear only two pair of socks (i.e only one pair of woollen socks). 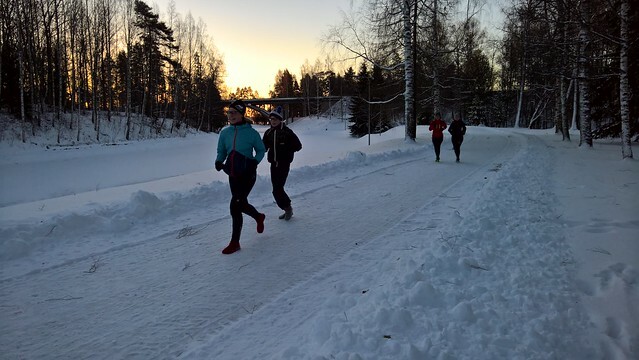 “This is my second winter when I do a bit more of running in woollen socks. I have used barefoot running shoes as my only running shoes for several years, so running in woollen socks during the winter felt like a good idea. “Wool socks are best suited in running on pure snow. If there’s sand or gravel on the snow, the socks might not last very long. They aren’t slippery in snow. If the surface is icy, you always have to be careful – and I think the softer surface feels better. 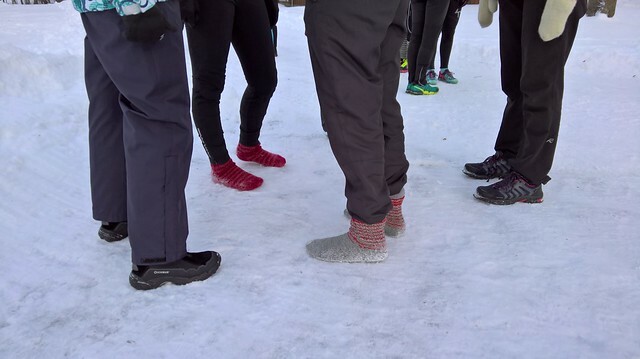 This year they are also organizing the national championships in woollen sock running in Finland, which just goes to show how many others are opting for this choice of footwear. Go Finland, go Tanja and go woolly socks!